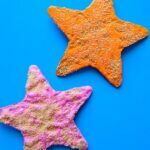 We love making ocean themed crafts in the summer so I was super excited when I found out that the Kids Craft Stars challenge this month was creating an ocean craft. One of our favorite ocean animals is the Octopus. 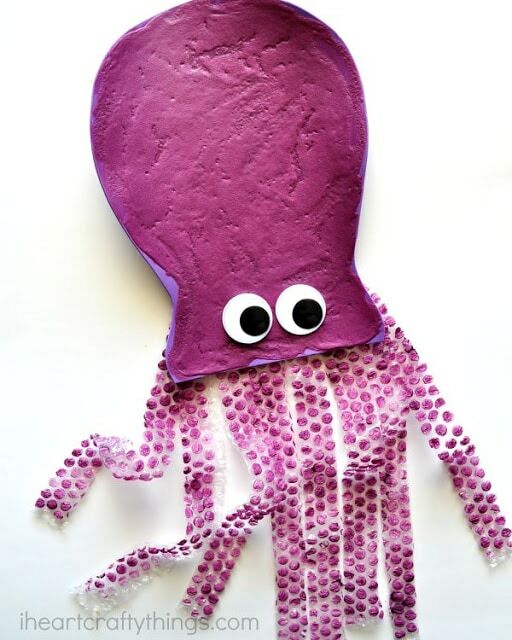 We’ve already made several Octopus crafts over the last few years, but we decided to create another one for the challenge and this time we added a fun component to it, puffy paint. 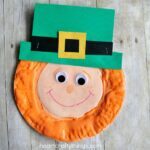 If you haven’t made puffy paint before, it’s a must try! It’s super simple to make and it gives a fun texture in crafts just like in our Puffy Paint Octopus Kid Craft. *We received our large wiggly eyes from Craftprojectideas.com. Any opinions expressed are my own. 1. Start by cutting an octopus body shape out of your large foam sheet. We made ours super big, but you can scale it down and make it whatever size you would like.2. Mix up your puffy paint. Here is how we make it: Mix 1/4 cup of Elmer’s school glue into a small bowl. 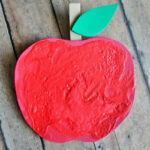 Add a squirt or two of your acrylic paint and mix it into the glue to color it. Add 1/4 cup of shaving cream into the glue mixture and fold it all together. 4. 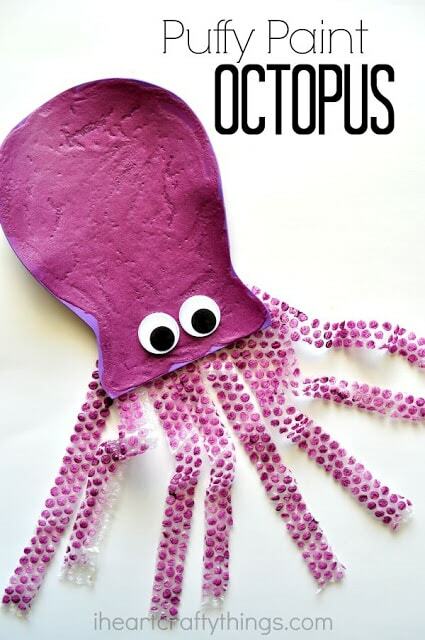 After painting your octopus, get out your piece of bubble wrap and paint it with the colors of your choice. Se it aside to dry. 5. 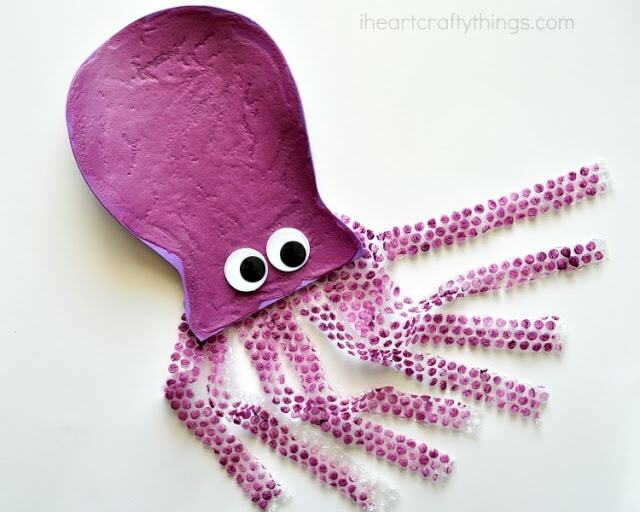 Once your pieces have dried, cut 8 strips out of your bubble wrap for the octopus legs. 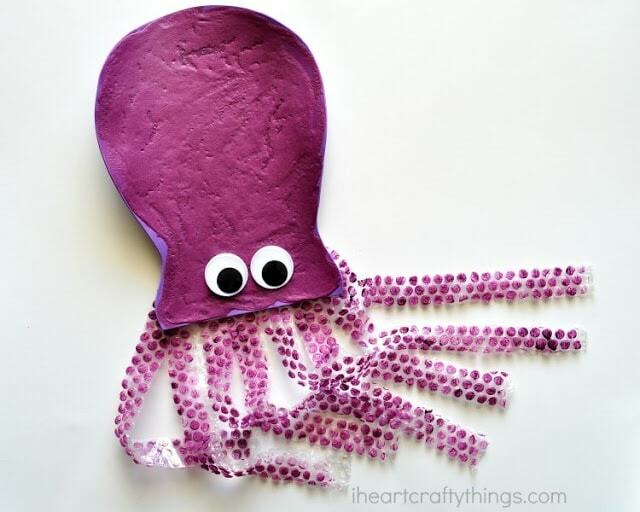 Use tacky glue to glue them onto the back of your octopus. 6. 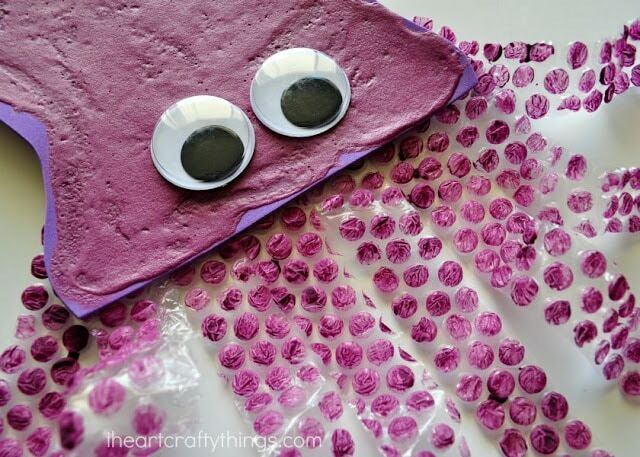 Finish your octopus by gluing your two large wiggly eyes on him. I love the fun texture created on the octopus with the puffy paint and the bubble wrap looks like little octopus suckers which is super fun! After the glue is finished drying, kids can pick up their octopus and swirl around it’s wiggly legs and pretend that he is swimming in the ocean. 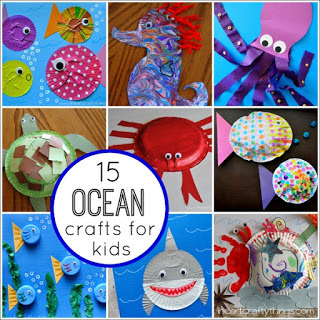 Make sure to check out these other fabulous ocean crafts from the kids craft stars! You can also keep up with our latest crafts by following our Pinterest Board or following our hashtag #kidscraftstars on Instagram.